This example will demonstrate both how to trigger ﴾launch﴿ a PowerShell script from a specific Windows Event, AND pass parameters to the PowerShell script from the Windows Event that triggered the script. For the purpose of this example, a test event will be generated using the built‐in EventCreate command‐line utility. Background: The scenario behind this example was a need to clean up a file‐share after a specific Windows Event occurred. A specific Windows Event was logged upon the success of a file watermarking process. The event used in this example loosely follows the original event format. Manually create the trigger event. 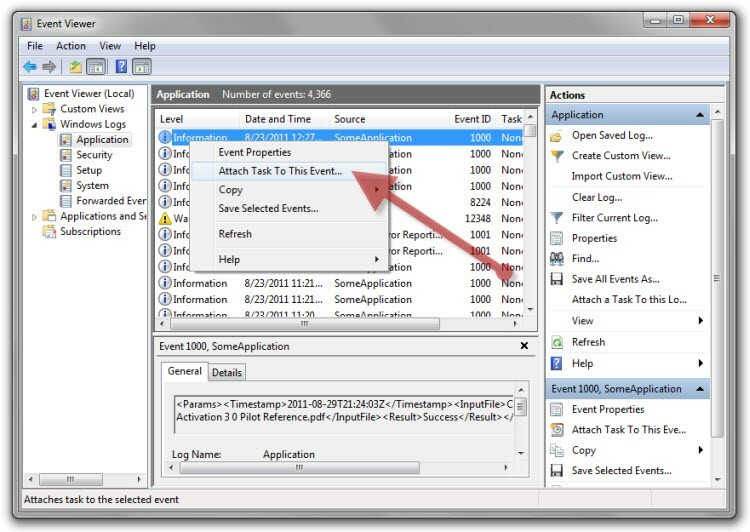 Use Event Viewer to create an event triggered task from the above event. Modify the task to expose event details to the downstream script. 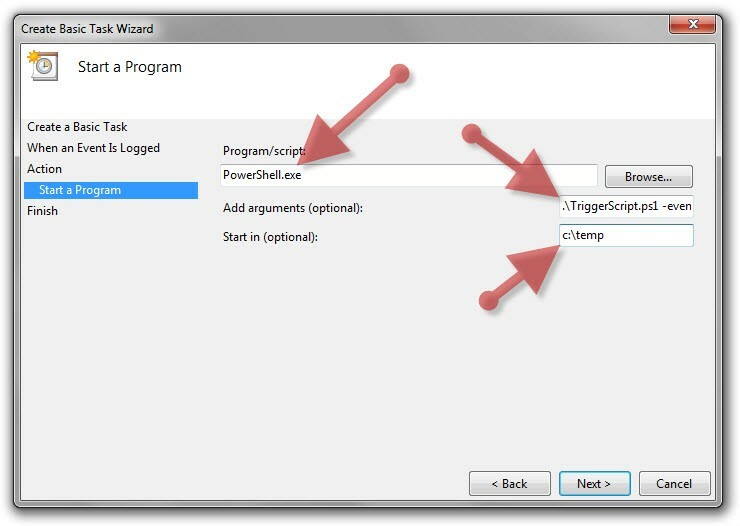 Implement the PowerShell script to be triggered. eventcreate /T INFORMATION /SO SomeApplication /ID 1000 /L APPLICATION /D "<Params><Timestamp>2011-08-29T21:24:03Z</Timestamp><InputFile>C:\temp\Some Test File.txt</InputFile><Result>Success</Result></Params>"
Step 2: Use the Event Viewer “Attach Task to This Event…” feature to create the task. 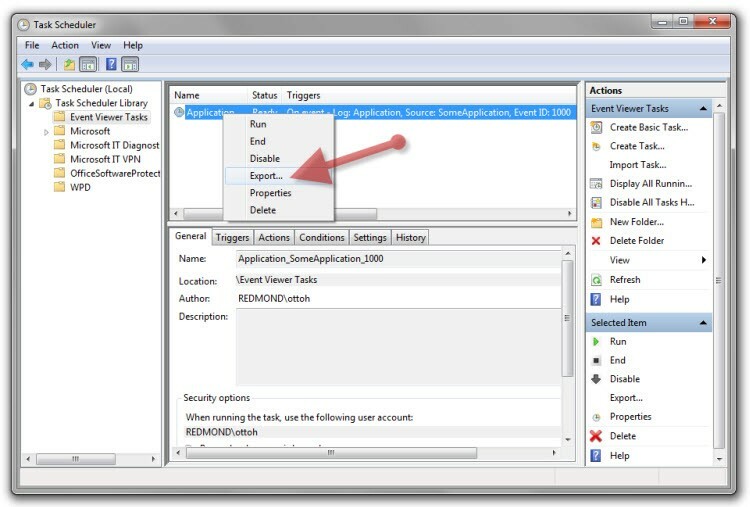 Launch “Event Viewer” and find the event you created in Step 1. It should be located toward the top of the “Windows Logs\Application” Log. Once found, right‐click on the event and select “Attach Task to This Event…” then use the defaults for the first couple screens of the wizard. From within Task Scheduler, export the newly created task ﴾as an XML file﴿. Right‐click on the task “Application_SomeApplication_1000” in the “Event Viewer Tasks” folder, and select “Export…”. schtasks /delete /TN "Event Viewer Tasks\Application_SomeApplication_1000"
Note: The script below is passed basic information about the event that triggered it. The script then queries the Windows Event Log to get more details about the event (the event payload). For this example, XML is used in the payload to separate the parameters, but any text can be passed as long as the script knows how to parse it. In addition, the “eventRecordID” that’s passed to the script should not be confused with the eventID of the event. The eventRecordID is a sequential number assigned to all events as they are logged to a specific channel. In addition, eventRecordIDs are only unique for a specific Channel (Log). # eventcreate /T INFORMATION /SO SomeApplication /ID 1000 /L APPLICATION /D "<Params><Timestamp>20110829T21:24:03Z</Timestamp><InputFile>C:\temp\Some Test File.txt</InputFile><Result>Success</Result></Params>"
$event = get-winevent -LogName $eventChannel -FilterXPath "<QueryList><Query Id='0' Path='$eventChannel'><Select Path='$eventChannel'>*[System [(EventRecordID=$eventRecordID)]]</Select></Query></QueryList>"
Note: Besides executing a script, a task can display a popup directly or send an email. An email can be useful for catching infrequent events on your system or in your environment. And a task can be deployed via Group Policy Preferences.